The unfinished concrete floor (below) is a Boston, Mass. garage that was being converted to office space. After seeing samples of different styles of concrete floor coatings, the owner decided on our dyed / stained concrete flooring system to highlight the character of the floor and compliment the natural brick wall. 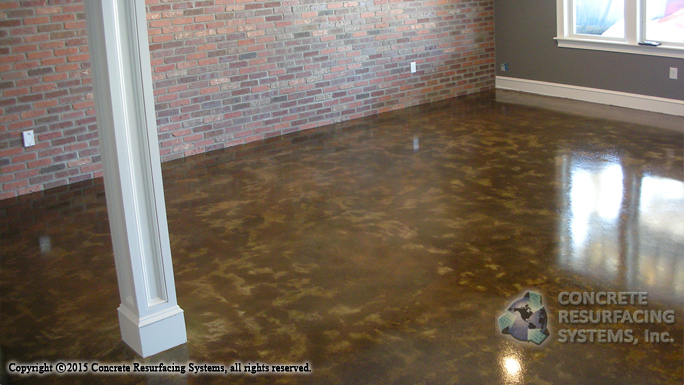 To accomplish the desired look, we used a diamond grinder to prep the old concrete floor, followed by concrete dye – stain application, (in the color “Walnut”), and an epoxy sealer top coat. This old garage floor is now open for business! 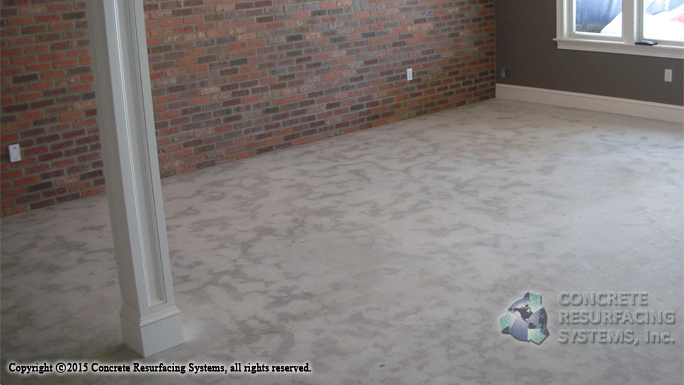 Are you remodeling unfinished space that has a bare concrete floor? Concrete Resurfacing Systems is factory trained and certified by several resinous flooring product manufacturers and has the experience to help you choose the right system based on the condition of your concrete floor and the type of traffic it will have.